Mailing list discussions. Legacy browsers for testing. 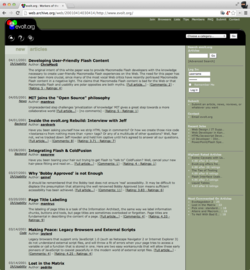 An article archive spanning 15 years. Join one of the world's longest-running web design communities. An exodus of members of the WIRED MonkeyJunkies web development community leads to the formation of evolt.org. evolt.org becomes more than a mailing list, building a site to hold articles written by community members. The site is upgraded again, with a new design reflecting improvements in HTML and CSS. 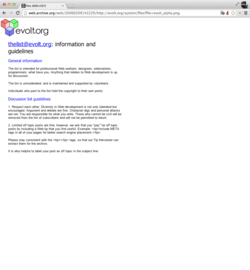 evolt.org three-point-oh: a new foundation built upon an industrial-grade CMS, and modern web standards. 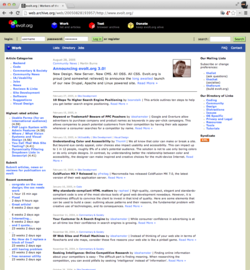 Founded in 1998, evolt.org is one of the oldest Web development communities in existence. Through our mailing lists, articles, and archives, we have strived to work together in sharing our collective knowledge to improve the Web for all of us. evolt.org is an all-volunteer organization that relies on the contributions of its members to operate and function. Thanks in part to the generous commitment of the web community, evolt.org provides renowned resources and information without advertisements. While we are no longer accepting articles for the site, you can still contribute to the mailing lists and the browser archive, and you can also contribute financially to the costs of running the infrastructure to support those services. Find out more about contributing to evolt.org. Many have built, given to, taken from and loved evolt.org. Here are some of their memories. I have lasting memories of the founding group and especially each personality contributing to a united effort. Since that start, I've met up with a number of people from the original group while overseas and still keep loosely in touch with a few. It was a really memorable time when so many of us were learning on the job and helping each other. I can't believe it's been that long. Some of my best friends in the world are people I've met through evolt.org. I remember watching the giant Stop the War march in London and thinking of how many of you were in it. How welcoming Mike King was when I dropped on his doorstep to stay a few days back in 2005. I remember meeting my lovely goddaughter (Martin and Lucy's daughter!) for the first time and looking into her huge and beautiful eyes. Funnily enough none of it is web related. It's all about the people. My story is simple. I owe the evolt community more than I could ever repay. A quick search through TheList archives and you can see when I was learning ASP (VBScript) and then PHP. Or when I was trying to write insane SQL queries across multiple databases. And every time I had a need, someone here had the knowledge and was willing to help. Without all the help from this community I don't think I'd have ever become as proficient a developer as I did. Over the years I've met a good number of 'self taught' developers and I learned that many of the pitfalls they fell into I managed to avoid because of TheList. For a very long time, I kept my family clothed and housed because of what I learned from y'all. Pretty sure I'd give Aardvark or Martin a kidney if they needed it. Or Elfur. Or Neuro or RonL or half a dozen others who don't come to mind so readily these days. Code? I don't remember what I did when or with whom. People? This list changed my life. Changed. My. Life.